Well, the weather has ever so slowly gotten better around here, but that hasn't proved into good opportunities to use the camera. But I did get out April 5th at Volunteer Park, but it wasnt' all that productive when people kept interrupting me to ask questions, recite poetry, or get in the way for snapshots of friends or relatives. But who can complain about a sunny day in the park? 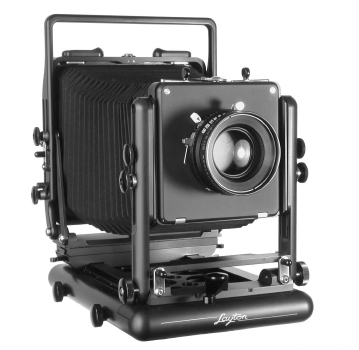 The list of places to learn the camera and large format photography, the former for the different movements and controls and the latter for film and exposure setting. The basic process is fairly straight-forward, but you have to follow it religiously because one mis-step or skip in the process with result in either a bad or no exposure, and at $4-5 a sheet for film and processing, mistakes aren't cheap. The camera (above)? Well, I got some good news that it's back on the road to production. It seems the manufacturer and production company wasn't putting the priority into the camera, and unfortunately this put the camera behind by more than a year (my estimate) and getting started learning large format photography and this camera. It's sad because this camera is highly recognized at a premier field camera. And so, that's the update to date. And spring is still trying to settle in here, albeit against winter's hold on thing so far, but hope is blooming like the flowers on warm, sunny days. And the box of exposed sheets keeps getting filled with new images.